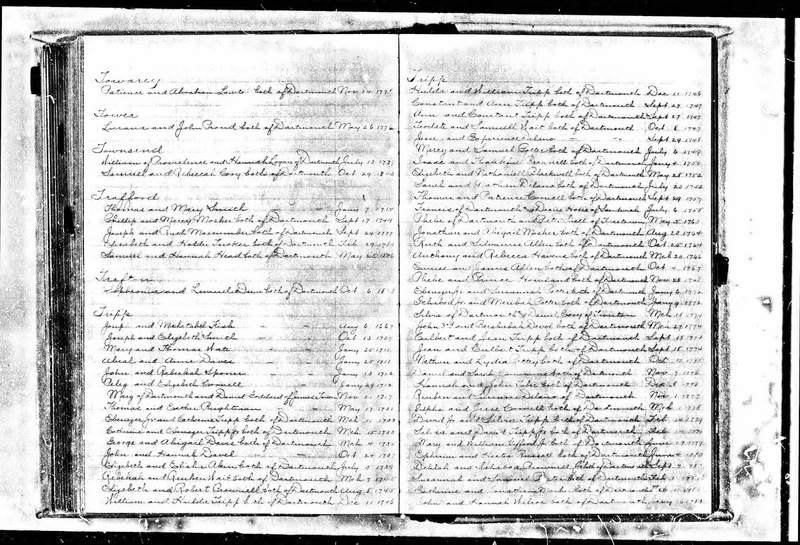 "LADD, Joseph, [of William and Elizabeth] Oct. 19, 1701"
"Rhode Island, Vital Records Extracts, 1636-1899," indexed database and digital image, Ancestry.com (http://www.ancestry.com : accessed 23 June 2014), Volume 4, Newport County Vital Records, "Little Compton - Births and Deaths," page 133 (image 500 of 691), Joseph Ladd birth entry. 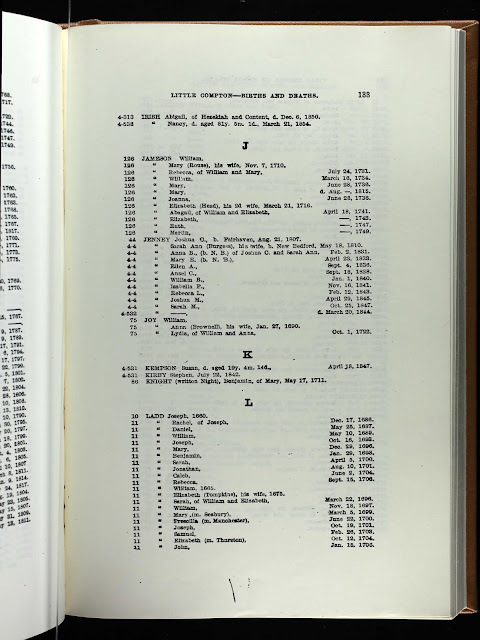 This record is a derivative source record for the birth of Joseph Ladd. The original record is in the Little Compton town record books, which are on the Family History Library US/CAN microfilm 946838 (available at the local FamilySearch Center). 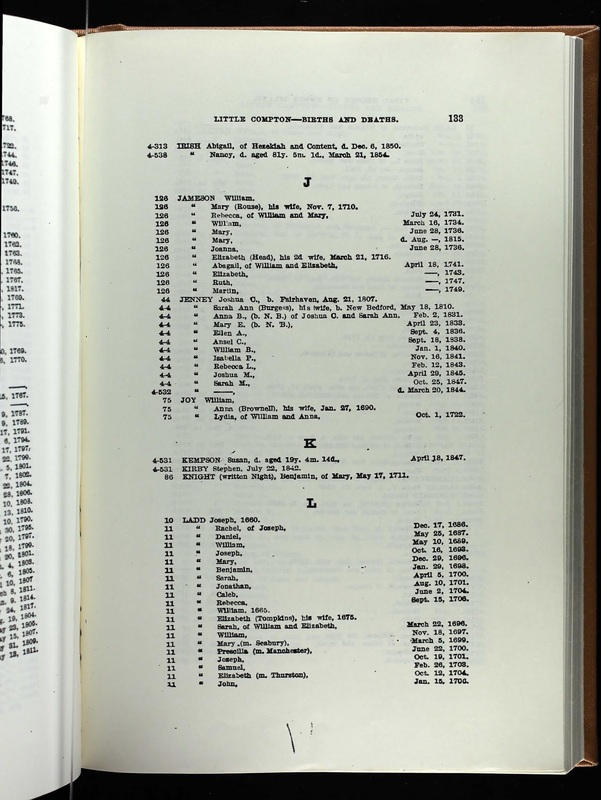 The information is also published in the book by Benjamin Franklin Wilbour, Little Compton Families ( Little Compton, R.I.: Little Compton Historical Society, 1967), on pages 389-391, Ladd Family sketches. Joseph Ladd (1701-1748) was the son of William Ladd and Elizabeth Tompkins. He married Lydia Gray (1707-???? ), the daughter of Samuel Gray and Deborah Church of Little Compton. 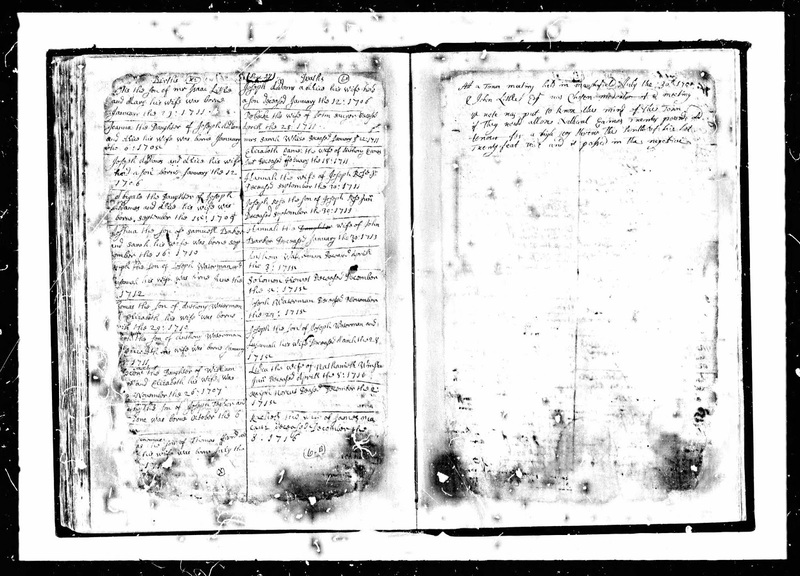 Joseph Ladd and Lydia Gray are my 6th great-grandparents, through their daughter Elizabeth Ladd (1735-1814) who married Benedict Oatley (1732-1821).